What Are The Benefits Of Standing Seam Metal Roofs? You are here: Home / Roof / What Are The Benefits Of Standing Seam Metal Roofs? Standing seam metal roof is a premiere roofing system with increased quality and longevity when compared to its predecessors. 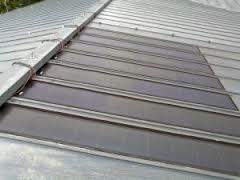 Its distinguishable feature is the concealed fasteners, which prevents roof leaks. There are plenty of choices for standing seam metal roofs in terms of color, shapes and finishes. By hiring an accomplished contractor, you can build something inspirational and distinctive. They are also available in a variety of metals like galvalum metal, galvanized steel and aluminum. When combined with acoustic insulation, they can reduce the sound reverberation and attenuation. They require minimal amount of resources during the manufacturing phase and are completely recyclable. They can also be produced directly onsite and do not need haulage and transportation. In addition to this, they can be easily integrated with the solar panels. Because of this property, solar heat is mostly reverted back to the surrounding rather than getting absorbed into your house. The metal roofs can be built with insulating materials so that the temperature of your house is maintained. Thus, you can save more on your electric bills. They are durable and are not susceptible to most damages. They are easy to clean and maintain. In a nutshell, they can last the whole lifetime of your building. You can also attract potential buyers with this high-quality roofing system.